What a nice idea, mix bluegrass and jazz fusion. Not that it hadn't been done before. The music here is nice light fusion, mosly banjo oriented (which is expected, since banjo is what Bela Fleck plays). However, there is not much prog to these tracks. There is some progressive thinking, especially in the drums. Or lack of drums. Roy "Future Man" Wooten plays "drums" on a Synthaxe (like the one Allan Holdsworth is known for playing). The effect is rather incredible. At most times, it really almost sounds like a drummer is actually playing, and playing well. Roy's brother Victor also does a splendid job on bass. But as noted above, the compositions are light, almost easy listening. And no prog, except for the final track, Tell It to the Gov'nor. But the sound was intriguing enough for me to check out their subsequent releases. From the looks of things it appears that there aren't a lot of Bela Fleck and the Flecktones fans on this site. Too bad. I can only hope that underexposed situation changes over time because these fellas are good. Real good. And any progger who likes to occasionally venture into areas of music that he/she might not naturally be attracted to for the sheer thrill of possibly discovering something unexpectedly cool should try BFF out for size. A banjo, harmonica, piano, funky bass and some kind of Frankenstein-ish drum machine contraption really do make for strange bedfellows. (Imagine, on a par, an accordion, ukulele, tuba and Indian tablas mixed together. I'd be skeptical, too.) Yet that's where the magic comes into play. These four imaginative souls don't think along the same lines that the rest of the musicians in the world do and their creations reflect and reinforce their gutsy eclecticism over and over again. In a word, they are interesting. And, on a planet teeming with has-beens and imitators, that's enough for me. After delving into their work shortly after their inclusion on this site I added quite a few of their CDs onto one of my online wish lists and, lo and behold, I got three of them for Christmas. (Most likely because they're relatively cheap and so are many of my relatives.) I'm always curious about debut albums because sometimes groups are so elated over getting a recording contract that they try too hard to please their new bosses and put out material that sounds like something else we've all heard before instead of just being themselves. Other times they proudly and stubbornly stick to their guns but also nakedly reveal their amateur status and the result is raw, ragged and unappealing. I found that neither applies to this hardy band of explorers. They're not only true to themselves but their professionalism is beyond reproach. Have I piqued your interest? If so, this one's not a bad place to start. The Latin-flavored "Sea Brazil" serves as an excellent introduction to the unique blend of instruments this quartet utilizes. It features tight kicks and arresting accents peppered throughout and every member gets a chance to shine on their own. A springy Jew's Harp sets the initial tone for the aptly-titled "Frontiers," a tune in which their delightful originality becomes very evident. The song hangs suspended by Bela's spry banjo as the rest of the group frolics around its distinctive timbre before the beat develops halfway through. This movement only lasts a while, though, as they end up erecting a loose but substantial structure upon a foundation made of thick, synthesized strings. The whole thing is remarkably involved. "Hurricane Camille" is a swift-paced, jazzy number where Howard Levy's piano and Victor Lemonte Wooten's bass are prominently displayed. Levy's superb keyboard work in particular is a wonderful surprise. He's got some serious chops. "Half Moon Bay" is a smooth, breezy piece in 6/4 time that can really take the edge off even your most stressful day. It's important to note that principal writer Fleck never forgets to sprinkle in the essential ingredient of melody into his compositions. Howard's spicy harmonica solo will grab your attention and Bela's sleek banjo ride ain't too shabby. There's a palpable Spanish aura hanging around "The Sinister Minister" but it's totally different from the feel of the album's opening cut. Here bassist Victor seizes his opportunity to dazzle all with his extraordinarily deft finger technique and he doesn't fail to impress. Some songs paint vivid aural pictures and "Sunset Road" causes me to envision a working man walking home in a golden dusk along a quiet country pathway. Levy's dense synthesizer settings provide a soft depth and his fresh piano solo arrives like a cool wind. "Flipper" emphasizes their strong jazz leanings and makes it apparent that they possess both an affinity and a talent for that genre. I detect a little Dave Brubeck in Howard's piano stylings and that's a huge compliment. Victor gets yet another chance to showcase his proficiency on the bass guitar and every time he does I shamelessly marvel at his gift. He ranks right up there with the best in prog. The two-sectioned "Mars Needs Women" is next. Part one is called "Space is a Lonely Place" and it's constructed around a banjo riff/chord progression in 7/8 that successfully conveys a sense of unwelcome solitude. The second part is "They're Here" and it's an odd little ditty in 9/8 that typifies their unconventional attitude. It doesn't sound like anyone else and that's what I came here for. "Reflections of Lucy" is a mesmerizing number inspired by some interspersed snippets of a well-known song by the Beatles but you really have to pay close attention to discern the familiar melody. The tune is respectful of the hallowed ground from which it sprang from but it has a personality all its own. With nary a skip of a beat "Tell it to the Gov'nor" closes things out and it's got more zip than early-morning customers leaving Starbucks. It provides enough space for everyone to slide into the spotlight one last time to parade their collective and virtuoso skills. The result is a blistering but fun track. I have to mention Roy "Future Man" Wooten at this late juncture because he blends in so well with the overall ambience being generated that he's easy to overlook. His personal invention, the "drumitar," doesn't sound like any drum machine I've ever heard and its uncanny proximity to real drums keeps his efforts from ever being contrary to the cause. Whatever it is he does with that thingamajig allows him the freedom to adapt brilliantly to every inflection and mood the music evokes and needs. He's definitely one-of-a-kind and indispensable to their art. Bear in mind that while these boys are courageous they aren't reckless. They aren't trying to re-invent the wheel. This isn't the kind of brazen jazz rock/fusion that will test your noise threshold or make your hair stand on end. For the most part this is pretty mellow fare without being boring or predictable. And there's a place for that in Progland. You can put this on when you want to relax or when you desire to have a little prog playing in the background while you read or when friends drop by. This album is not necessarily a must- have album but there are no glaring shortcomings to rag on, either. It's a pleasant, enlightening listening experience. Whatever you do, don't let the banjo's dour reputation mislead you into thinking this is some kind of a hillbilly hootenanny on acid. You'd be dead wrong. The musicianship is phenomenal and you'll probably get a charge out of turning your know-it-all progger buddies onto them. 3.5 stars. 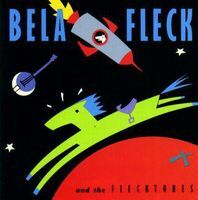 Post a review of BELA FLECK AND THE FLECKTONES "Béla Fleck and the Flecktones"